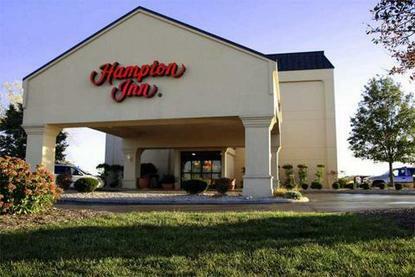 Hampton Inn Washington Court House is located off I-71, halfway between Columbus and Cincinnati, within walking distance to restaurants and outlet mall shopping. Ohio Factory Shops is adjacent to the hotel and offers over 85 outlets. Jeffersonville Outlet Mall is 4 miles northeast and offers 75 shops and restaurants. We are 14 miles from Deer Creek Lodge State Park and 19 miles from Rocky Fork Golf Course.Our traditional style, 58 room hotel includes 4 whirlpool rooms and 1 suite with whirlpool, Indoor pool, Spaelevator, exercise gym, and voice mail. Amenities include complimentary deluxe continental breakfast, in-room microwave, refrigerator, coffee maker,iron and ironing board, TV, VCR,hair dryer and guest laundromat. We also offer cribs and rollaway beds.